So there's a story going around today that Walmart is working on an Amazon Prime competitor. Code named Tahoe, the service would cost $50 and offer free shipping on up to a million items sold on Walmart.com. Wal-Mart Stores Inc. will test a new unlimited shipping service for online shoppers this summer that will be priced below Amazon's $99 per year Prime service. Wal-Mart, the world's largest retailer, told The Associated Press on Wednesday that the shipping subscription service will cost customers $50 a year. Products will arrive in three days or less. My mother swears by Walmart, so I ran this story by her to get her opinion and see if she would pay $50 a year to get free shipping. Nope. She already gets free shipping from Walmart. She just has to spend $50 or more and then wait a week, which is no hardship. I mean, do you know realize easy it is to buy $50 worth of consumables like toilet paper and detergent? 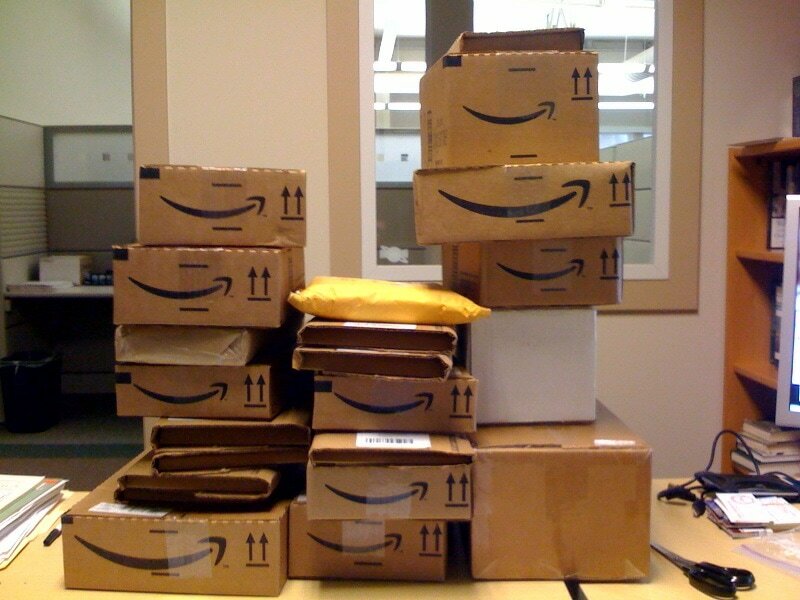 True, Amazon will give you free shipping on orders totaling more than $35, but that only applies to eligible items. Walmart's offer covers almost everything on the website (with certain obvious exceptions like tires, photo, pharmacy). Folks, just about the only reason Walmart could need this program is not to compete with Amazon on fast shipping but to capture more hype. This program isn't going to draw any loyal Amazon customers away; we're already signed up for Prime and are happy with it. It also won't boost Walmart's online sales (which continue to grow more slowly than Amazon) because Walmart's problem isn't how little people are spending there but whether consumers even think to shop there. The real reason Walmart's online sales lag Amazon's sales is that Amazon has the buzz and Walmart does not. Amazon gets lots and lots of free coverage on tech and business blog as the hot new prospect, while Walmart is the stodgy old boring retailer. The buzz, or more specifically the free publicity it entails, is the real reason Amazon revenues continue to grow while Walmart stagnates at over six times Amazon's size. Consumers are constantly reminded about shopping at Amazon, while Walmart is still viewed in terms of their physical stores. If this program helps Walmart build buzz then the retailer's online operation will get more attention and thus more sales. If not, no one will know about the program much less use the program. Do you suppose this is going to help? Paul makes a good point that Amazon is so far ahead of the competition in storefront design that everyone else is playing catch-up. Just for fun, I opened the Walmart site and checked the availability of a couple things I have queued up for my next Amazon order. 42 gauge electrical wire – I was surprised at how many offering Walmart had in wire, but the specific gauge and spool size I needed didn’t come up on the first couple of pages, so I gave up. 6 inch triangular saw file – Plenty of chainsaw files at the Walmart site, but none of the triangular saw files needed to sharpen a hand saw. Garmin in-hull depth sounder – Walmart has it, but it costs $6 more than the corresponding item at Amazon. Actually, I’m not all that thrilled with the design of Amazon’s site or its search function. The search has always returned far too many irrelevant results, and I don’t find the site easy to navigate. I’ve found Walmart’s website to be as easy to use as Amazon’s. Just about the only part of Amazon’s site that I find useful is the way you can filter a category. That is nice. My specific comment was meant to be from the point you put it in the cart. Amazon is light years ahead of the competition (still!) on that score. On average over 60-75% of people will put something in the cart and not buy it. What Walmart SHOULD do is a) concentrate on keeping their popular items stocked, making sure entire sections of shelves aren’t empty, and have more than a skeleton crew at the height of shopping. I don’t expect to get exfoliating body wash during middle-of-the-night stocking or fabric cut at 1am, but I do expect both at 1pm and without a problem or delay. Lately I can’t find what I want, the shelves aren’t stocked, and there’s no one minding a whole swath of atore that includes housewares, fabric, crafts, and office supplies (that’s a quarter of the store, right there). And b) have a website where you can check if something is in stock at your store. It tries, bless its sweet little heart, but it’s never right. They don’t have to compete with Amazon, but there’s more than one reason people are turning to Amazon for soap and TP. It’s ’cause that shelf at WM is empty. Oh, I forgot one important point (which the WSJ covered rather extensively): WM’s big mistake, which they have never recovered from (hence, empty shelves and lack of employees) was getting rid of the fabric. Crafts, maybe not so much, but getting rid of fabric in rural areas was a slap in the face and made a lot of people lose trust. Of course people get whatever ELSE from Amazon more cheaply AND get it delivered. Yes, WM put a token section back in, but it’s a ghost of its former self. I’ve used Walmart ship to store and ship to home–this deal is actually appealing to me. I shop at Walmart far more than Amazon–both instore and online. I shop FOR my mother at Walmart and have stuff shipped to her. My brother does the same thing–but he uses Amazon. No way would I pay 100 dollars to Amazon. I find their prices too high. But Walmart for 50? I’d consider it. We have quite a few items we buy there on a monthly or bi-monthly basis. One of those items is cat food that we used to buy on Amazon, but they often raise the price as soon as you do the auto refill. We changed to Walmart for that item and several others and their prices haven’t change. Every now and then we consolidate to get the free shipping (which I think is about at the 35 dollar mark). So I don’t think this kind of thing should be negated. It could be a powerful and useful tool. Will it help them compete? I don’t know–Amazon’s high prices knocked me away from them probably two to three years ago on many items. It won’t hurt though. It also doesn’t hurt Amazon that Prime membership includes Prime Video and Prime Music (which I have started using a lot more, lately). Plus I know that with Amazon any returns will be easy and painless.